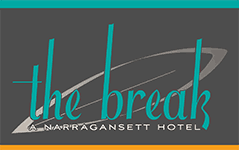 Catered by our acclaimed restaurant, Chair 5, your Narragansett event or gathering will go off with out a hitch at The Break. Full main dining room can accommodate rehearsal dinners, dinner or lunch meetings, parties and other functions. Private dining room (400 square feet) offers a variety of set-up options to meet your needs and budget. 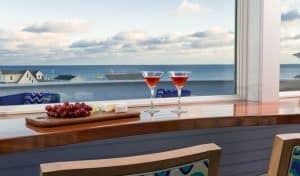 Rooftop provides stunning ocean views and both indoor and outdoor spaces for celebrations. Offering a bar area and cozy alcoves, the rooftop is the spot for wedding/baby showers, birthdays, anniversaries, company parties, girls’ nights out, watching a game, or any other occasion! Please call or email us at events@thebreakhotel.com or submit the below form to book an event. Click here to view our Events Menu.